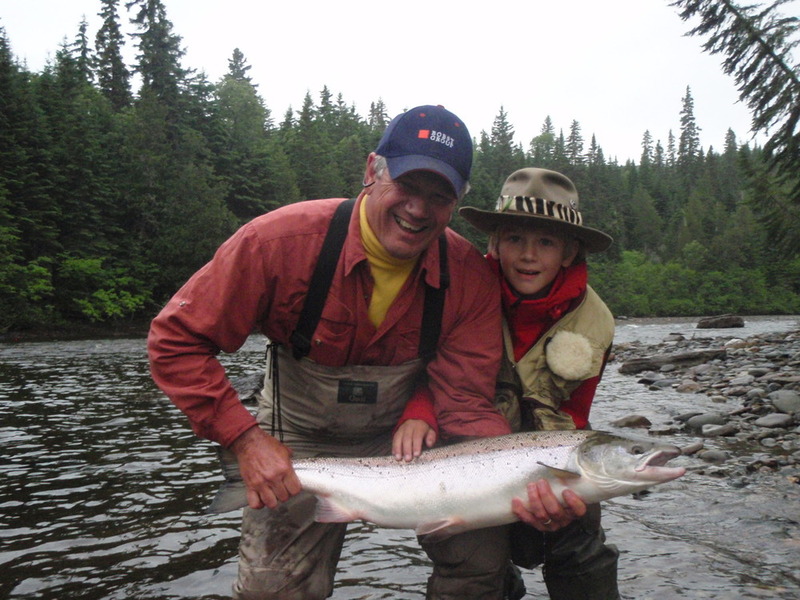 Henri Pfeifle a 10 year old from Darian, Conn hooked landed and released his first Atlantic Salmon on June 25th, 2011. Henri was at Salmon Lodge along with his Grand parents, John & Mel Pfeifle, his uncles Tom, Drew, and Rand Hinman as well as his Great Grand Parents Richard & Barbara Hinman. On Saturday June 25th, 2011 Henri was fishing along side of his Grand father while be guided by Clement Bernier better known as HAWKEYE. Henri was fishing down through the pool with a Black Stone fly while listening to Clement's helpful tips when he hooked up. He played the fish on his own and brought it into Clements net. Henri then had a few pictures taken and with the help of his Grand Father released the fish back into the river. Once arriving back at the lodge Clement told me that Henri played the fish like a pro!!! !